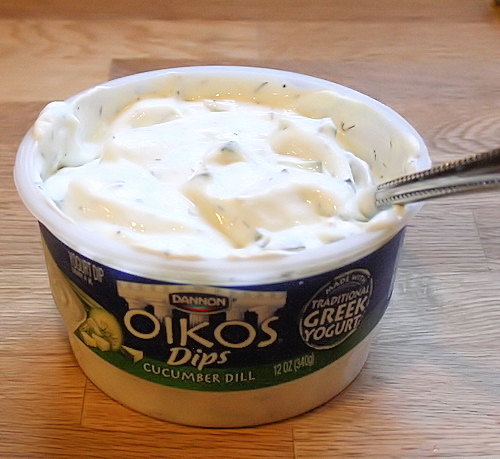 To say that I am in love with the new Oikos Greek yogurt dip would be an understatement. 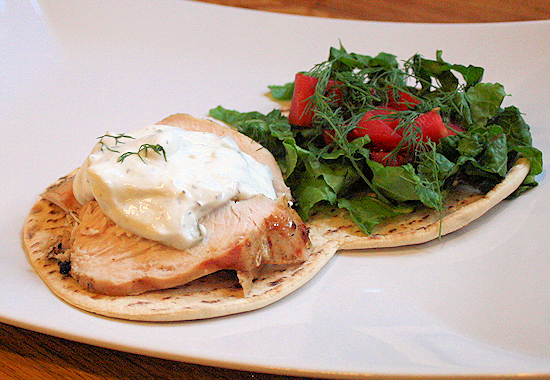 I love this as a dressing, as dip for chips, on gyros or fish and now my new favorite; chicken gyros. That is essentially what this is and it’s oh so simple to make. 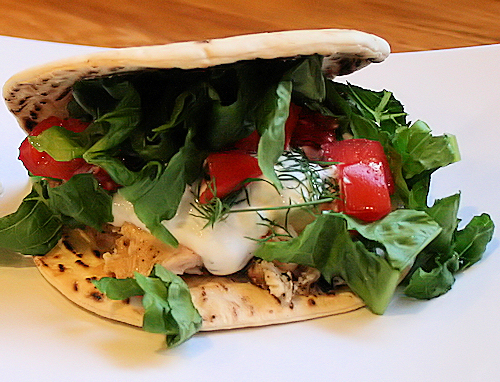 I cut down on the carbs and calories with this by grilling the chicken and by using Flat-Outs in place of the traditional pita bread. They only have 100 calories, they are low fat and are a good source of fiber. 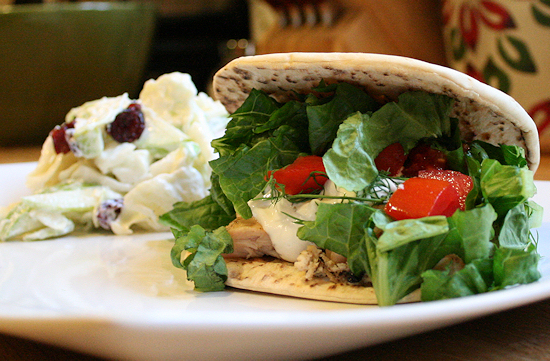 They are nice and light and I liked how it let all the flavors shine through. 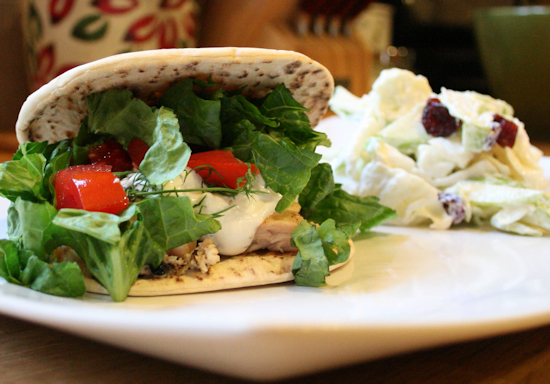 All of these components together made for a wonderful light gyro that was bursting with all those traditional gyro flavors. First thing is to get your chicken marinating. 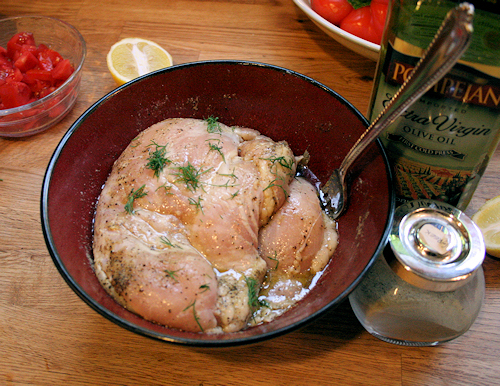 In a large bowl, add your chicken , the dressing, olive oil, Greek seasoning and squeeze in the lemon but do not throw the lemon away. 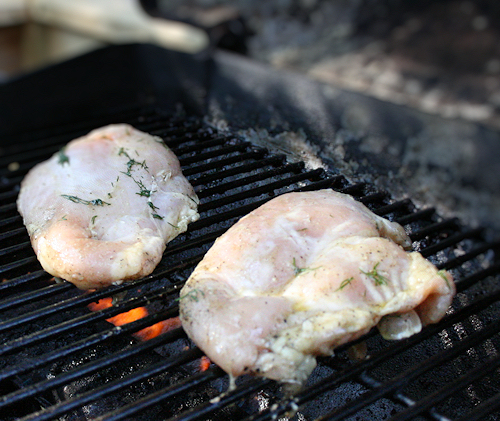 Lemon is the key for making the chicken stay tender and oh so juicy on the grill. Let that marinate while you get all your other components together. Letting this sit in the fridge over night or while you are at work would really let the flavors set in too. Unfortunately for me I was making this on the fly and I must say it still turned out awesome. Marinate for at least 20-30minutes. Next, start to prep all of your components. 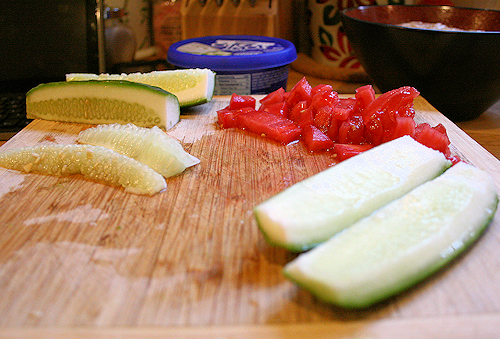 First thing to do is slice that cucumber and remove the seeds, then dice the tomato into small bite size pieces. Once the seeds are removed, cut the cucumber into small bite size pieces as well. 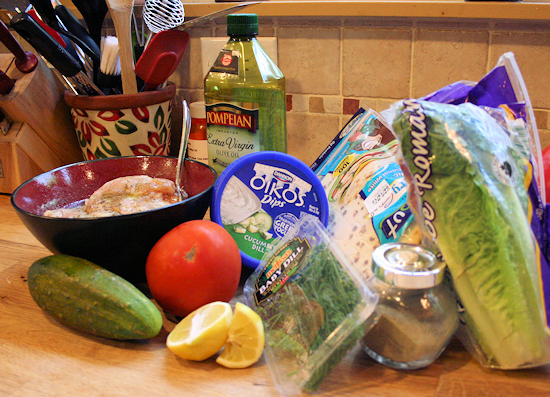 The cucumber will be added into the Oikos dip to make it more like a tzatziki sauce. 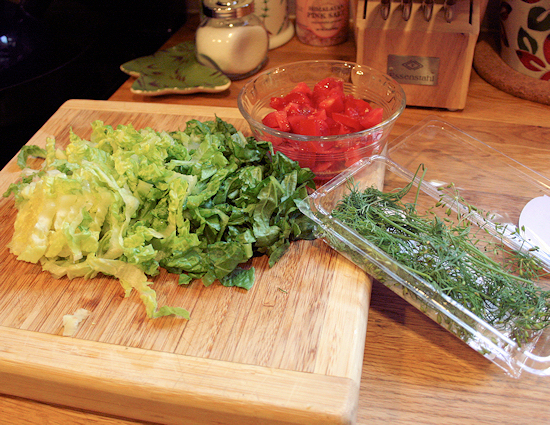 Next, rough chop the lettuce, get your dill out and a pair of scissors. The scissors make cutting the dill super easy. 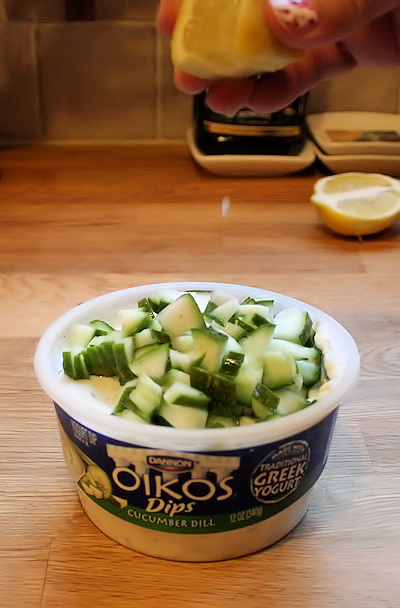 Into the Oikos dip, you will add the cucumber; about 1/2 cup (set the rest aside if you have some remaining) and 2 sprigs of dill. Just cut it right into the dip. Lastly, add the last big squeeze out of that lemon and stir. Yum. 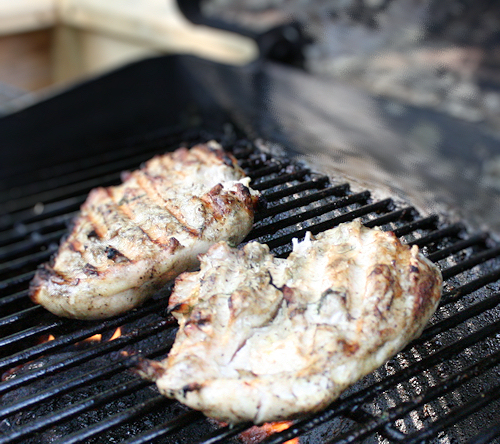 We are now ready to get that chicken on the grill. Med heat so they do not burn. 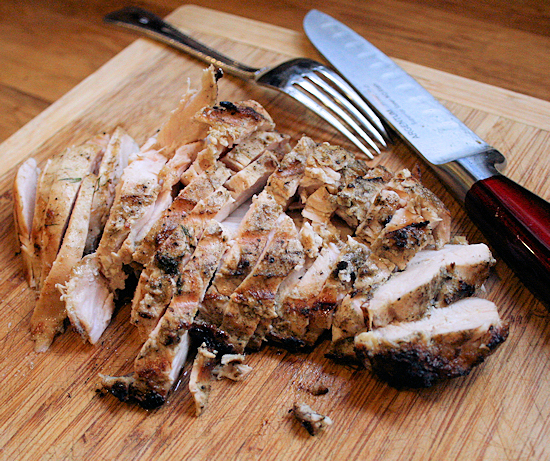 Slice the chicken into nice thin strips and try not eat any. Just try! This chicken was so moist and tender. Yes, I tasted it, maybe more than once. OK A lot, but it was very good. Now for the assembly. See how easy prepping made everything? On one side of the Flat-Out (I love the shape of these! 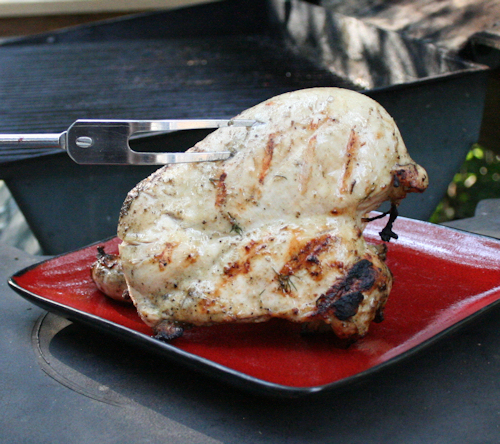 ), add your perfectly cooked chicken and a nice size plop of the dip. 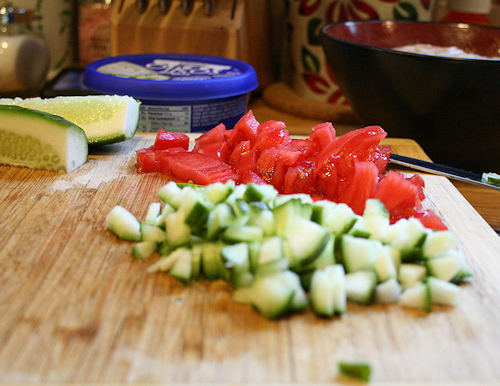 On the other, add lettuce, tomato, a few fresh sprigs of dill and sprinkle on some of that left over cucumber. Fold and eat! I served this sandwich with my coconut cranberry apple slaw and it was so nice to sit outside at the end of the summer weather and eat something nice, light and refreshing. Can something this low calorie really taste so wonderful? You betchya! Enjoy.